Barcelona feared that the end of the transfer window could be complicated and that seems to be the case. Paris Saint-Germain are chasing a top midfielder and have turned their attention to Camp Nou. 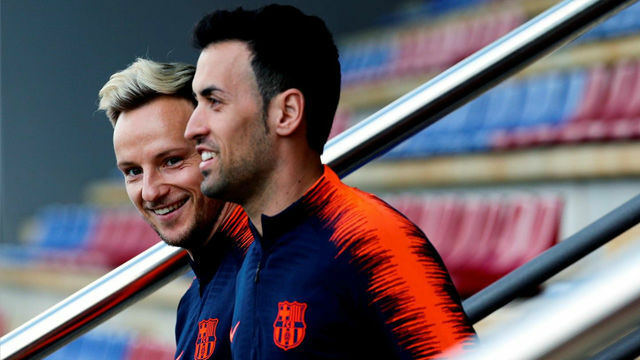 In concrete, the Ligue 1 champions are interested in Sergio Busquets and Ivan Rakitic. Barça don't want to sell so everything would depend on the players. As for Busquets, the club have moved to offer a new deal which would be signed in Septmber. PSG have been after a midfielder all summer. They have tried to sign Pogba, Pjanic and Kante but have been unable to strike a deal. So eyes have moved on to Barça, as with Neymar last summer. Nothing will be easy becasue the Catalan club will try and block all moves and, therefore, have been renewing and improving their best players' deals over the last year. RAC1 report Barça have close a new deal with Busquets, who will have an improved salary, a €200 million release (or around there) and a contract until 2021. Barça knew first hand of PSG's interest and moved quickly. Rakitic's situation is a little different. He renewed last year until 2021 and has a €125 million release clause. His value's shot up after the World Cup and lots of teams have asked about him. The Croatian is happy at Barça and in Barcelona but is not one of the top earners. He is 30 and it's clear that if he turns down big offers, the La Liga champions would have to compensate him with a wage hike, something which is not planned for at the moment. PSG and their coach have had him on their radar for a few weeks. Barça know PSG's intentions and don't want to sell but there are almost two weeks left in the transfer market and anything could happen with the French side in the middle. For now, there is calm, as Barça wait to see if a huge offer -- or a release clause deal -- is around the corner.